I hope you all had a wonderful Thanksgiving! What made ours even warmer was the gorgeous weather in Charlotte. It felt like spring time! This was a very special Thanksgiving because my parents and sister and her family all relocated to Charlotte earlier this year. We had a great potluck spread and my sister hosted. She made some incredible stuffing made with whole grain sourdough, carrots, celery, onions, and apples as well as a hearty kale salad with homemade orange vinaigrette. My mom fixed sautéed green beans with almonds and a three cheese gluten free macaroni and cheese. I made a shepherd’s pie and bundt cake with an orange anise buttercream icing that just made it over the top good. And…now it’s time to get back on track, right? I find it difficult to stay very motivated between now and January 1. After all, it’s really easy to say to myself that it’s only the holidays for a few more weeks so what’s the harm? But I also know the self loathing and regret that can follow. 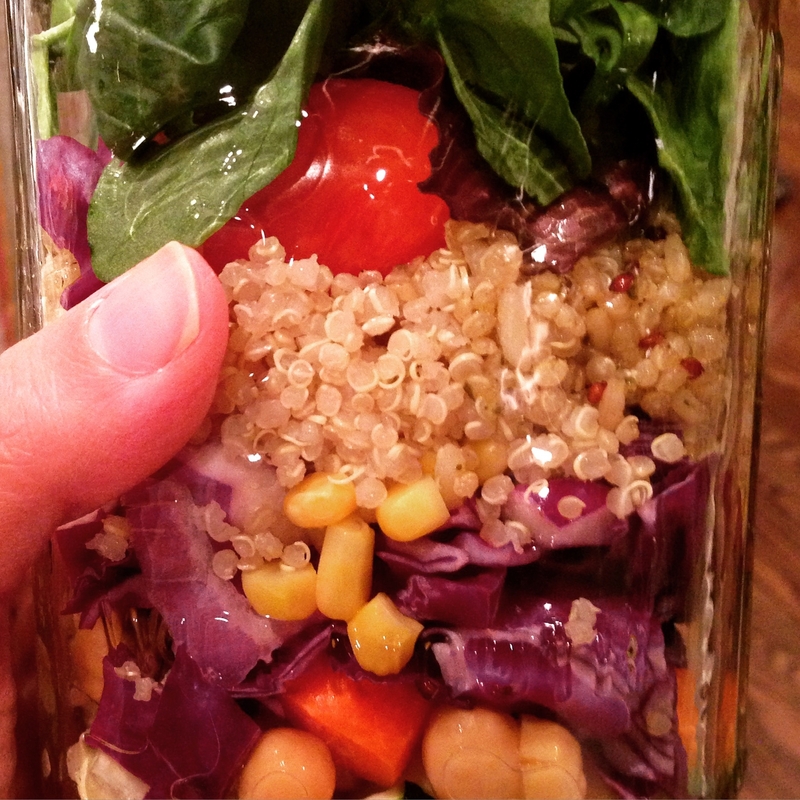 Convenience is everything and that is where mason jar salads come in. 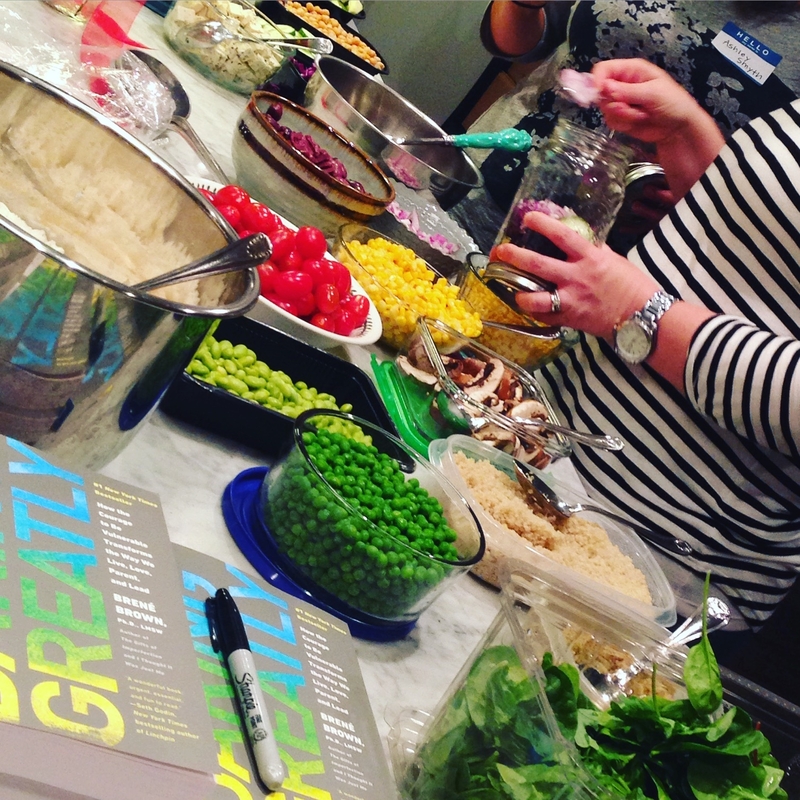 Last week, I was invited to a get together with some local health coaches, Juice Plus distributors(message me if you want to inquire about this), and like minded friends who are at various points in their journey towards better eating. 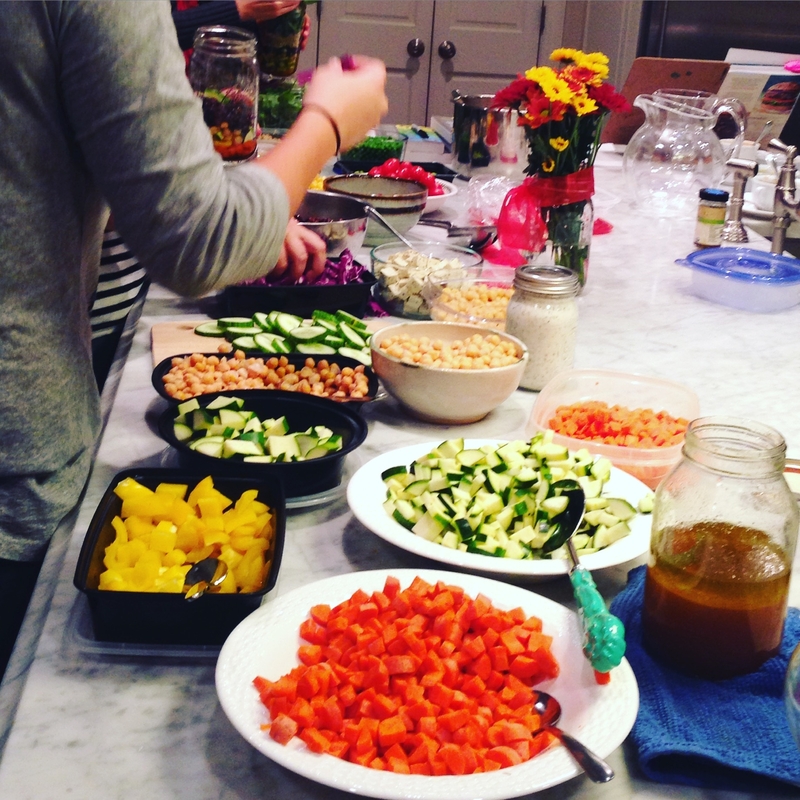 The host provided large mason jars, greens, and homemade salad dressings and everyone had to bring 2 salad toppings. It was an awesome, colorful party! We each left with 3 big salads. There were all kinds of vegetables, legumes, grains, seeds, and proteins providing quite a spread to choose from. The co-host was so generous bringing everyone a copy of Daring Greatly which we are going to discuss at our January meeting. <3 One of my very favorite and most life changing books. So pretty, right? And even easier to grab and more attractive to eat when it’s all ready for you when you open the fridge. 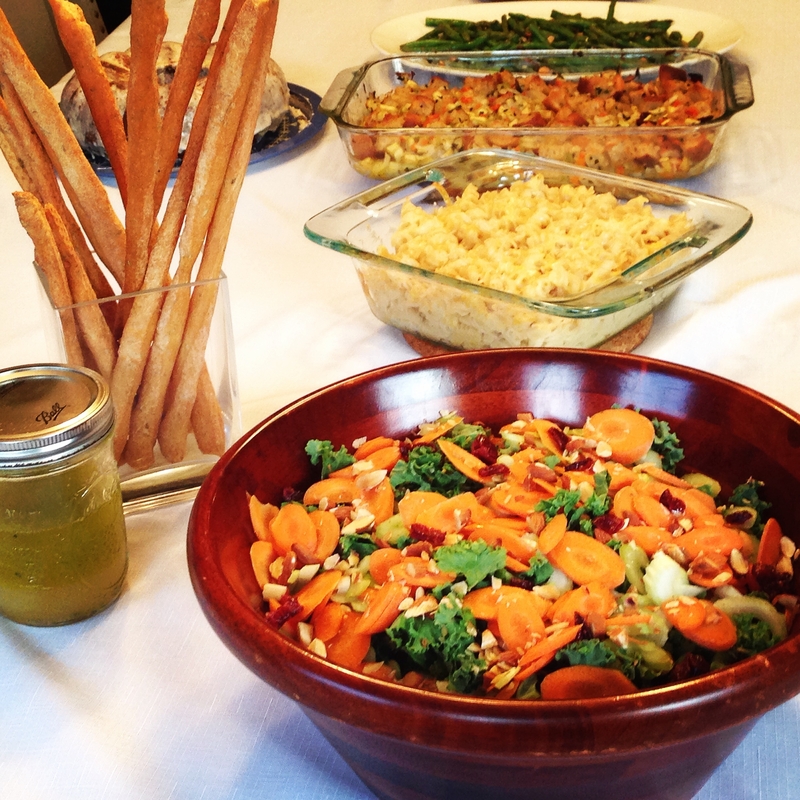 I poured the salads into big bowls and the whole family enjoyed the various combinations. 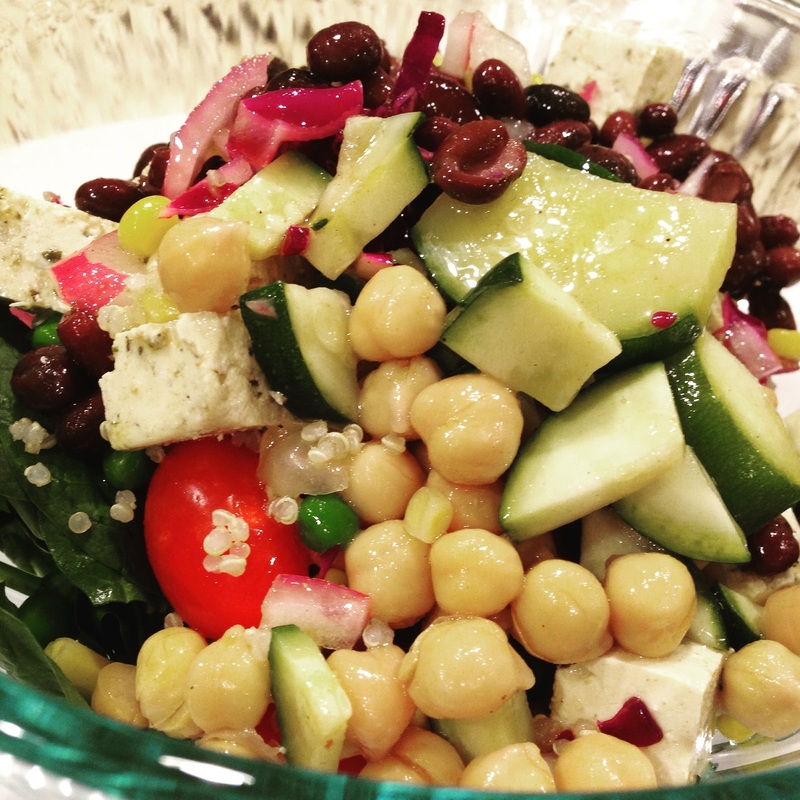 The one above has spinach, chickpeas, zucchini, grape tomatoes, green peas, herbed organic tofu, quinoa, black beans, red onion, and purple cabbage. I brought my homemade ranch dressing and it was a hit! I also did a chopped salad including carrots and yellow bell peppers. 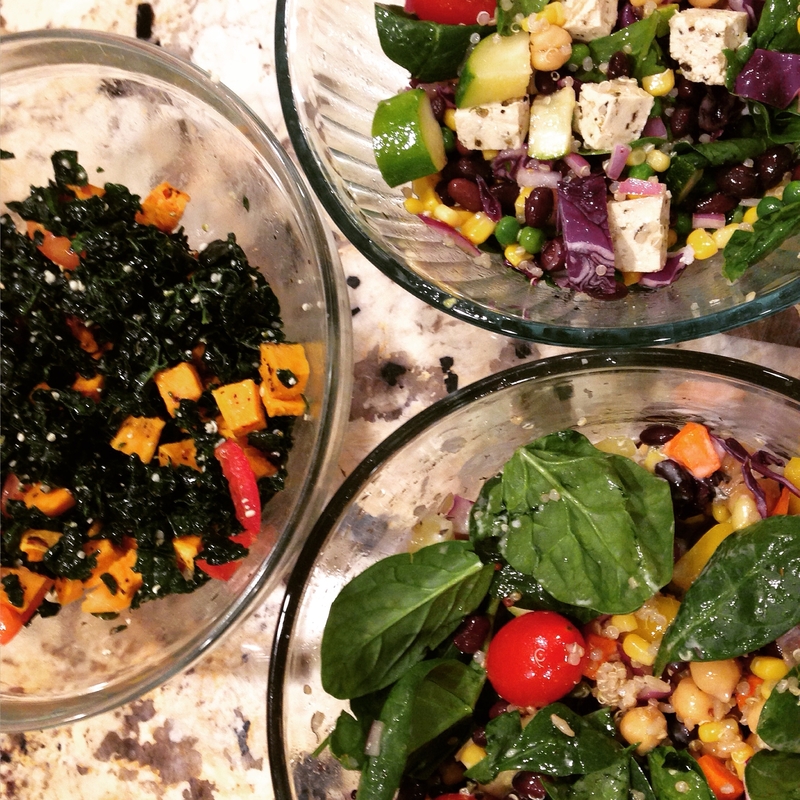 It was fun to see what everyone else chose: one friend kept it simple with greens, corn, cabbage, and chickpeas. I appreciated how the salads kept really well in the fridge for 5 days. 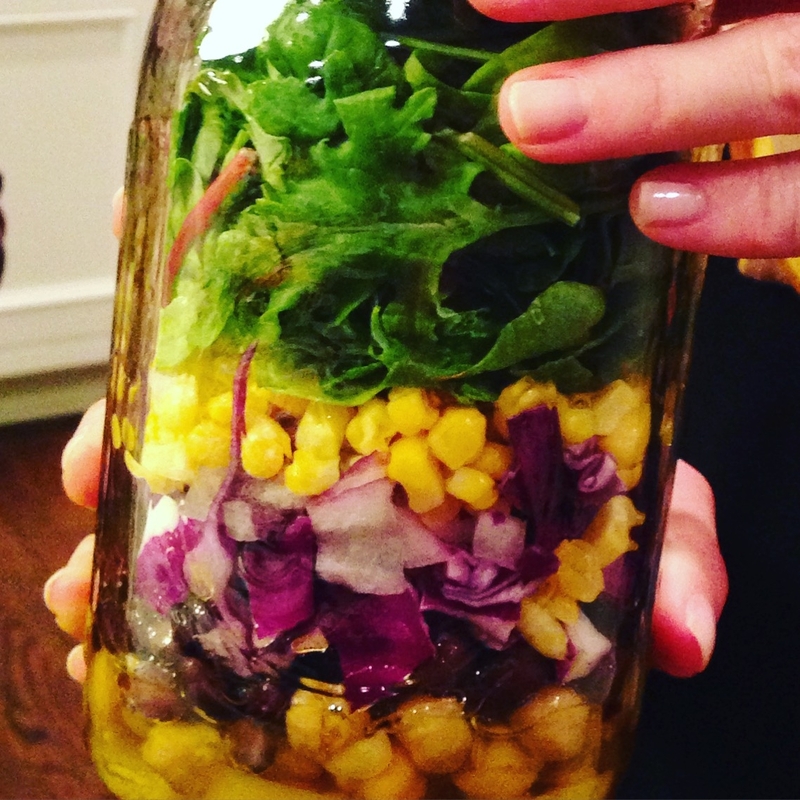 If you plan on eating it on the go, don’t fill the mason jar up all the way so there is room to shake it all up when you’re ready to dig in! Pour 1-3 tbsp dressing into the bottom of your jar first. Layer ingredients by most sturdy/crispy to softest. Have fun; you really can’t go wrong! I also wanted to let you know that I will be participating in this healthy happy holiday party with food that I’ve made and recipe demonstrations as well as free healthy eating consultations. I would love to see some friendly faces there and especially meet some readers! I am saving space and seats for you and there will be childcare ($10 per family for 2 hours). Oh, man, I want to come with you to Thanksgiving next year!